Every night, [Roberto]’s kitchen counter is cluttered with three cell phones, three different cell phone chargers and a mess of wires until morning comes and the chargers are moved to a drawer for the following night. For [Roberto] this is a bit of a pain – a much easier solution would be to have a few USB ports embedded right into his kitchen backsplash. With the right tools, this can be easily done, resulting in a very professional looking installation for charging a trio of phones. 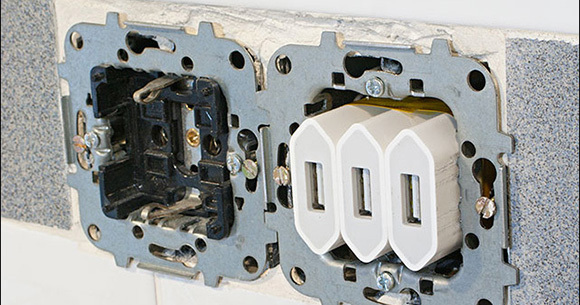 After removing a Euro AC outlet and replacing it with three iPhone chargers, [Roberto] simply soldered the six mains connections on the chargers to his house’s wiring. This resulted in a perfectly functional but rather ugly home project, though. The next step was to machine a blank AC outlet cover for the three USB ports. [Roberto]’s CNC mill made quick work of this piece of plastic and turned it into a professional-looking installation.